Ashghal and Kahramaa officials at the press conference in Doha. 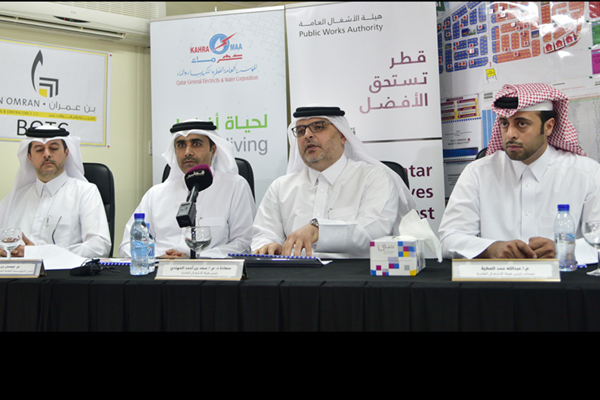 Qatar's public works authority Ashghal is set to allocate 10,400 land plots over the next three years for infrastructure projects, with a prime focus on residential units across the country. This year, infrastructure of Al Wukair North and Al Mashaf West areas will be completed, which will serve 1,829 land plots. In 2018, 2019, 2020, and 2021, infrastructure facilities will be completed to serve 1,303, 2,511, 2,487 and 2,270 land plots respectively, stated Al Tamimi. Ashghal is expected to deliver this project in 2017, in addition to delivering the Roads and Infrastructure for Citizens Sub-Divisions in Al Wukair North project, which together include 1,829 land plots, he added. On the Al Mashaf West (Package 3), Ashghal said the project is aimed at converting Al Mashaf West area into a sustainable residential area that can accommodate the future population growth. This package includes 1,186 land plots. The project involves construction of a local roads network with a total length of 70 km, which includes 92 main and local streets in addition to the construction of 13 signallised intersections of which three are major interchanges, and the provision of street lighting.